Travel-loving families fit nicely into the 2017 Honda HR-V, which supplies all five passengers with long-haul comfort at an incredible rate. Combine that comfort with Honda's versatile cabin configurations and the HR-V's smart, budget-friendly approach and it's hard to imagine a better crossover for your needs. Squads of all sizes love the 2017 Honda HR-V cabin. Both rows supply the head and leg room you need to pack your adult-size friends or family in for a comfortable ride. The HR-V's unique Magic Seat features flip-up rear seat cushions that create enough space to haul your bicycle to the park. Behind the rear seats, the HR-V supplies an impressive cargo cache, with 24.3 cubic feet of cargo space for everyday items like groceries. When you need to haul large items like your new monster flat-screen TV, the Magic Seat flips neatly forward to create 58.5 cubic feet of maximum space. Connectivity is second nature to the HR-V, so you never have to worry about missing a text or phone call-or sacrificing safety to do so. 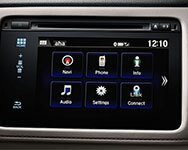 The HondaLink infotainment system will read your texts to you! The 7-inch touchscreen display is easy to figure out, with an intuitive menu system that makes it easy to find the feature you want, whether you're trying to make a call or find your favorite Pandora station. If your device battery is in the red, simply plug it into the HR-V's USB port for a quick charge. Your life is busy-your vehicle shouldn't make it harder to keep up. Honda knows that safety is a major priority. That's why it's designed the HR-V to provide high levels of passenger protection, with clever tech features that deliver helpful feedback on your surroundings to help you avoid an accident. The passenger-side blind-spot camera, for example, jumps into action when you employ the right-hand turn signal. It displays your blind spot on the HR-V's central touchscreen, so you can better spot any vehicles that might be in your path. The navigation system includes voice controls, so you can switch destinations without taking your hands off the wheel. The HR-V also impresses with its crash-test scores. In government crash tests, it earned a perfect five stars for overall protection. The Insurance Institute of Highway Safety gave the HR-V its top score of "Good." Driving the 2017 Honda HR-V isn't merely confidence-inspiring - it's downright sporty. Handling comes naturally, so fitting the HR-V through a narrow gap is completely uncomplicated. The HR-V is tuned for an athletic performance, yet it also feels smooth and composed when you guide it over rockier roads. Moreover, it gives you the power you crave without shorting you at the pump. 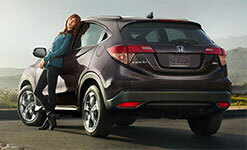 Depending on which powertrain you like, the HR-V earns up to 28 city/34 highway mpg. If you want a little luxury to go with the HR-V's family-style utility, check out the 2017 Honda HR-V EX-L Navi. This crossover is fully loaded with everything you need for a posh road adventure, including leather upholstery. It's probably no surprise that the EX-L Navi is the model with the upgraded navigation system, which includes voice controls and Honda HD Digital Traffic, making it easy and safe to find the best route to any destination. The HR-V specializes in family-friendly passenger space. Infotainment technology plays your music collection and reads your texts aloud. Send power to all four wheels for a little extra help getting through rugged territory. Plot the best route with voice-activated navigation and Honda HD Digital Traffic. When you need a little extra convenience - not to mention style - in your life, the 2017 Honda HR-V happily provides it. Even with a packed cabin, all five passengers enjoy plenty of room, and your safety package keeps you out of trouble. This crossover is more than a fine choice for families - it caters to all adventurous drivers with its all-wheel-drive system and road-trip-savvy fuel economy.